This Penn team was truly exceptional, playing their way to an impressive 17 game winning streak to end the season. Had it not been for a cancelled game on May 31, they may very well have stretched it to 18. They finished the season with an overall record of 21-3, registering 10.7 runs per game while giving up 4.1. Four team members of this team played major league baseball. Wagenhurst had played for the Philadelphia Quakers in 1888, before entering Penn’s Law School. 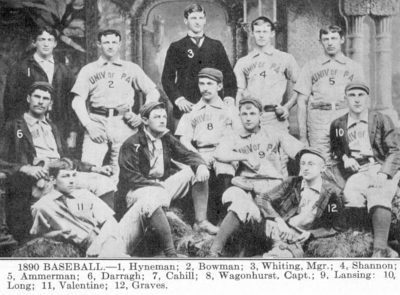 Bowman played for the Philadelphia Phillies and then the Pittsburgh Alleghenies from June of 1890 through the 1891 season, while still a Penn law student. Darragh played with the for Louisville Colonels the season of his Dental School graduation; that same year (1891) Cahill left Medical School to play along with Darragh for the Louisville Colonels. Note that the team photograph includes Hyneman, the previous year’s team captain who had graduated the year before. He is not listed in the team roster provided in either the 1890 yearbook or the 1913 Athletic Association history of Penn athletics. The newsclipping shown below also names Joseph A. Cake, ’92 Medical, and W.S. Dougherty, ’90, as members of this team.